Prof. Reineke and his LEXOS team work with simple plastic foils with a thickness of less than 50 μm, which is thinner than a human hair. 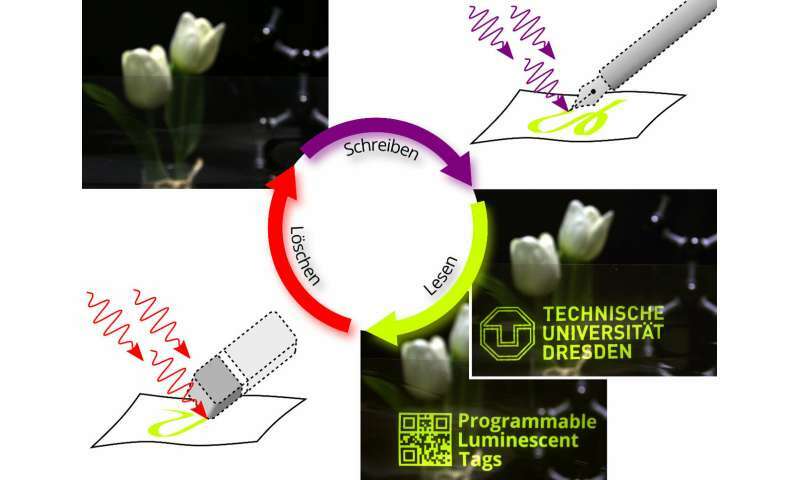 In these transparent plastic foils, they introduce organic luminescent molecules. In the beginning, these molecules are in an inactive, dark state. By locally using ultraviolet irradiation, it is possible to turn this dark state into an active, luminescent one. By mask illumination or laser writing, activated patterns can be printed onto the foil with a resolution that is comparable to common laser printers. Similar to glow-in-the-dark stickers, the patterns can be made to shine and the imprinted information can be read. By illuminating with infrared light, the tag is erased completely and new data can be written into it. 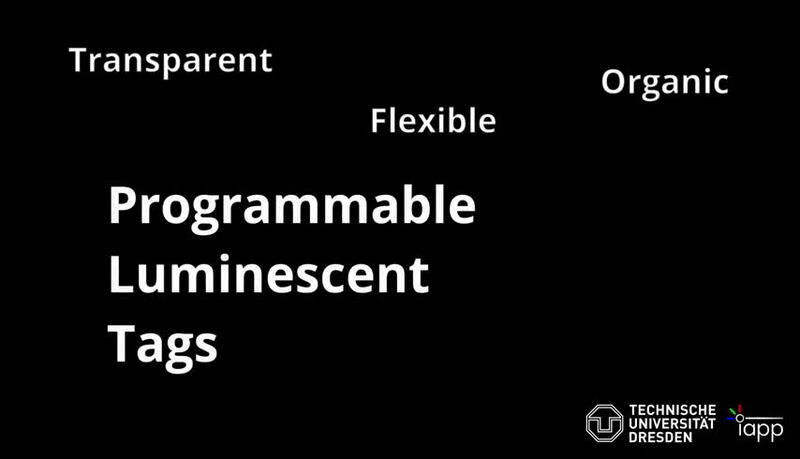 The working principle of these programmable transparent tags is based on the well-known oxygen molecule. Oxygen is present in the plastic foil and steals the light energy from the glowing molecules. Ultraviolet radiation induces a chemical reaction which efficiently removes the oxygen from the layer. As a result, the luminescent molecules are activated and are able to emit light. The deactivation process using infrared light is based on a temperature rise of the foil, leading to an increased oxygen permeability and therefore a refilling of the layer with oxygen. These novel tags can be manufactured in any size. The low material costs of less than €2 per square meter promise a wide range of possible applications, including barcodes, serial numbers or addresses that can be hidden for on-demand readout only. Also, these invisible tags could propel document security and anti-counterfeiting to a whole new level. Prof. Reineke is already thinking further ahead: "Those invisible and re-writable tags can be used in a multitude of ways. We can manufacture such tags thinner than conventional barcode stickers. These tags can become a versatile alternative to many frequently technology-laden solutions for information exchange in our daily life. 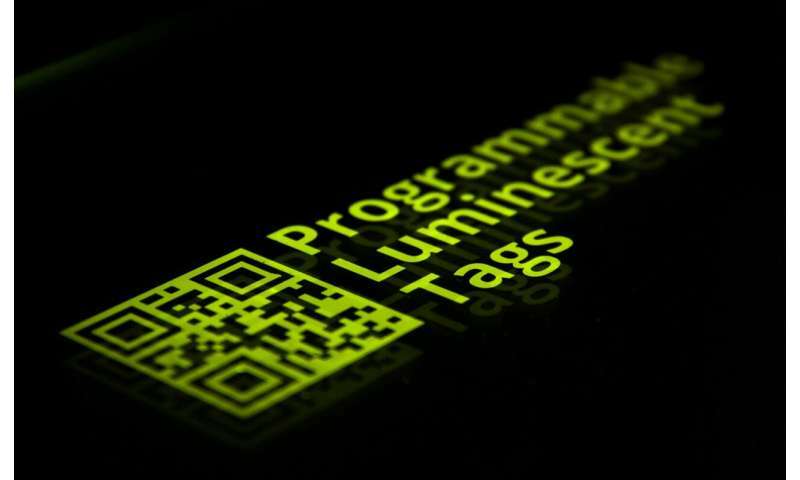 These luminescent tags make electronics obsolete at the location where the information is stored. The development and optimisation of such systems open a broad research field bringing together material development, process engineering, and fundamental research in an interdisciplinary fashion.